Within the actual cave – a candidate for UNESCO World Heritage Site status – There are more than a thousand drawings, paintings and sculptures, including 423 images of animals; all carried out 36,000 years ago. There are engravings with stone and with finger and paintings with colour pigments applied by blowing, such as the one of the hand below that looks like it was done using a stencil. No human had entered the cave until Jean-Marie Chauvet, Éliette Brunel and Christian Hillaire did so in the course of research in December 1994. Up to now, the general populace has not been able to appreciate for itself what is considered to be a jewel of palaeolithic parietal art but which is in too fragile a state to be open to the public. The example of the famous Lascaux Caves in the Dordogne bears witness to this level of caution as it became threatened with final extinction at one point such was the severity of threats from bacteria and fungus. The Chauvet Pont d’Arc facsimile measures over 3,000m2; it is ten times the size of the huge Lascaux replica. When completed by the ArecetOs/Atelier Dallis company of Dordogne and Toulouse, it will be the largest of its type ever created. 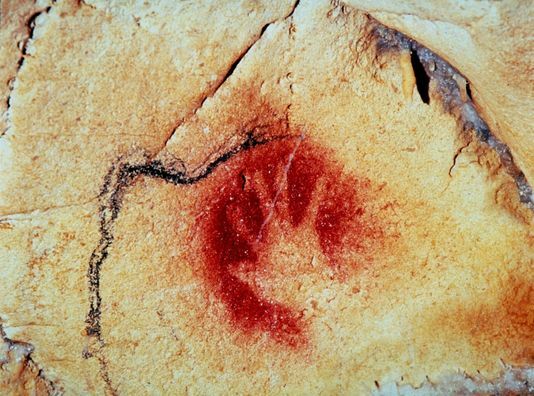 The Hand of History: A prehistoric stencilled image in the Chauvet Pont d’Arc Cave. Inside this recreated prehistoric cave, all five senses of the visitors are expected to be stimulated by the coolness, the humidity, the silence, the darkness and the characteristic odours of the underground environment. A €100 million interpretative centre will complete the experience for visitors, explaining the the world of palaeontology, its fauna and it flora. The centre is expected to welcome between 300,000 and 400,000 tourists annually. By way of tantalising the expectant public and any visitors to France until the opening of the Chauvet facsimile at the end of next year, an exhibition entitled “Chasses Magiques” (Magical Hunts) has been organised by the Musée du Quai Branly. The exhibition runs from the 2nd of July to the 3rd of November this year and will take place in the Château de Vogüé, which is located close to the cave. It’s the result of a collaboration between the local castle and the Parisian museum. The latter has agreed to lend 55 works from its collection, chosen to evoke the thoughts of the hunter-gatherers through the ages.